Complete communication develops and enhances reputation of an organization. Moreover, they are cost saving as no crucial information is missing and no additional cost is incurred in conveying extra message if the communication is complete. A complete communication always gives additional information wherever required. It leaves no questions in the mind of receiver. Complete communication helps in better decision-making by the audience/readers/receivers of message as they get all desired and crucial information. It is both time-saving as well as cost-saving. It underlines and highlights the main message as it avoids using excessive and needless words. Concise communication provides short and essential message in limited words to the audience. Concise message is more appealing and comprehensible to the audience. Concise message is non-repetitive in nature. Empathize with the audience and exhibit interest in the audience. This will stimulate a positive reaction from the audience. Show optimism towards your audience. Emphasize on “what is possible” rather than “what is impossible”. Lay stress on positive words such as jovial, committed, thanks, warm, healthy, help, etc. Complete clarity of thoughts and ideas enhances the meaning of message. Clear message makes use of exact, appropriate and concrete words. It is supported with specific facts and figures. It makes use of words that are clear and that build the reputation. Concrete messages are not misinterpreted. Courtesy implies taking into consideration both viewpoints as well as feelings of the receiver of the message. Courteous message is positive and focused at the audience. It makes use of terms showing respect for the receiver of message. It is not at all biased. The message is exact, correct and well-timed. If the communication is correct, it boosts up the confidence level. Correct message has greater impact on the audience/readers. It checks for the precision and accurateness of facts and figures used in the message. It makes use of appropriate and correct language in the message. 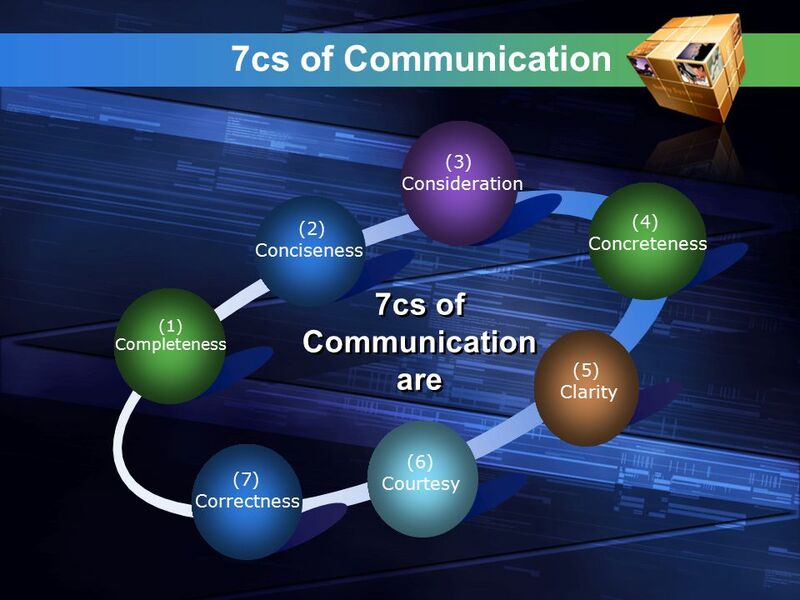 Awareness of these 7 C’s of communication makes you an effective communicator.